Gerhard Munthe (1849–1929) is one of the most unique and important artists of the Art Nouveau movement and a significant contributor to its international diversity. His radical, abstract style based partly on old Norwegian folk art is today considered a precursor of twentieth-century Modernism. Among Munthe’s greatest achievements are his countless room decorations, of which the Fairy-Tale Room at Holmenkollen Turisthotell (1896–98) in Oslo and Håkonshallen (1910–15) in Bergen are the most significant. A series of his watercolours based on old Norwegian ballads and Norse mythology made in 1892–93 became the basis for a renewal of the decorative arts in northern Europe, notably in the weaving industry. His creative vignettes and illustrations for Snorri Sturluson’s Sagas of the Old Norwegian Kings (1896–99) influenced several European artists. Munthe was one of Norway’s first industrial designers, and his work covers most fields within the decorative arts: tapestries, carpets, furniture, stained glass, silver, porcelain, wallpaper, wrought iron, book bindings, fonts and bookplates. 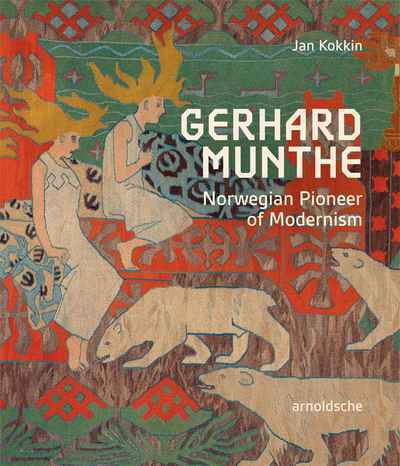 This richly illustrated book offers a review of Gerhard Munthe’s prolific production as a decorative artist and designer spanning almost forty years.